This past Monday night was the deadline for Zenfolio's Featured Image Contest. The theme was "All About Light." "We are looking for images that are striking because of their use of light, natural or artificial, witnessed or controlled. We will accept a lot of flexibility in the subject but the light must 'make the shot.' … [The images] should make the viewer pause, take a deep breath, and admire the work." On Monday, Zenfolio will announce the top 30 images, which folks will have opportunity to vote down to the final 10 winners. I entered 13 images, which appear below with titles and vignettes, from oldest to most recent. And quickly, people have been bugging me about downloading photos from Zenfolio, so now you can. The images will have no imprinted "©" label, and are $1.50 for the same size as the blog (720px on the largest dimension), $5 for 1600px, $10 for a 3-megapixel image (for instance, 2125x1411px), and $16 for a 5-megapixel image (2744x1822px). Just click on an image. And as always, I'm still feeling things out, so these are subject to change. Cheers! In June of 2004, I got my D70 as a graduation present. Excited to put it to use, I drove around the Richmond area, looking for cool things to shoot. During one excursion in mid July, I came across the Virginia War Memorial, a monument dedicated to the memories of Virginians who died in World War II, the Korean War, the Vietnam War, and the Gulf War. 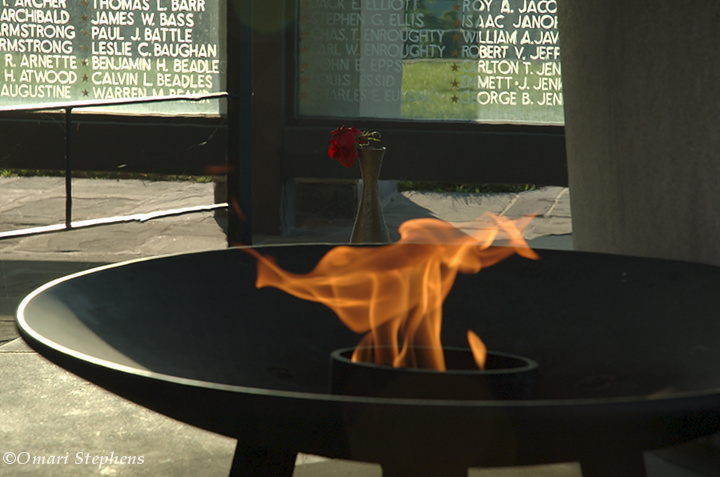 After walking around, reading names, and reflecting for a bit, I noticed this flame and the solitary rose, sitting at the base of a huge yet solemn statue. I upped the aperture until the names were clearly legible, framed, and took a few shots, including this one. Two weeks later, I noticed the nearly-full moon shining brightly outside my family's front door. It had been raining some, and the droplets on the leaves shone in the moonlight. 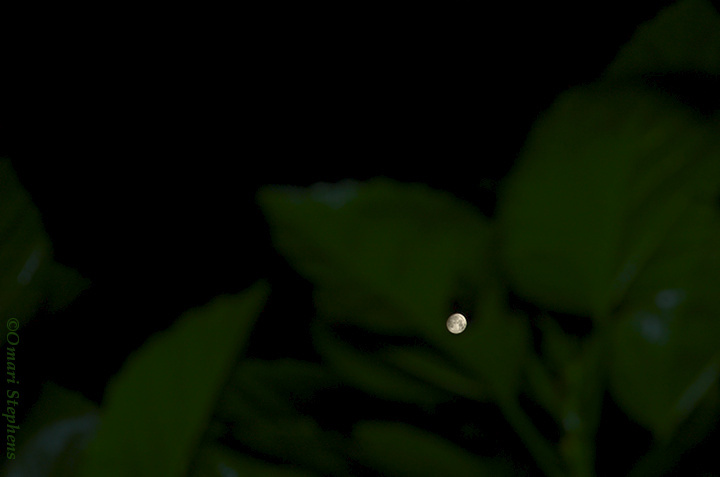 I made a few attempts at shooting the moon alone, and then the moon composed with the leaves, before I noticed a hole in of the leaves. I honed in on the exposure, flash settings, and composition that I wanted and finally nailed it. This has been one of my favorite images ever since. After I arrived at MIT in late August of 2004, I heard about some sodium drop thing, and went to watch. 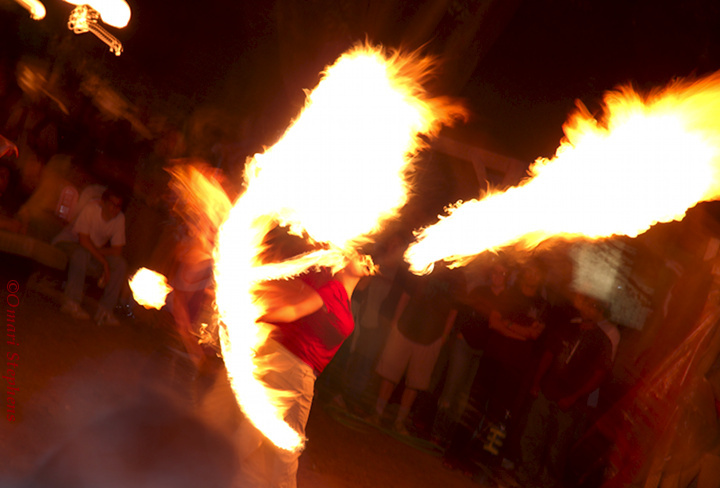 Before the actual Drop, some of the upperclassmen put on a fire-breathing/fire-spinning show. Somehow, and I'm really not sure how, I got this shot. You get lucky sometimes. I used this image for my inaugural blog post, "Moo. ", on July 27th of last year. One morning, I noticed a brilliant sunrise beyond a mass of clouds. I tried a bunch of different compositions before I found this tree, and I took a number of shots of the tree before the gecko ambled into view, essentially completing the frame. 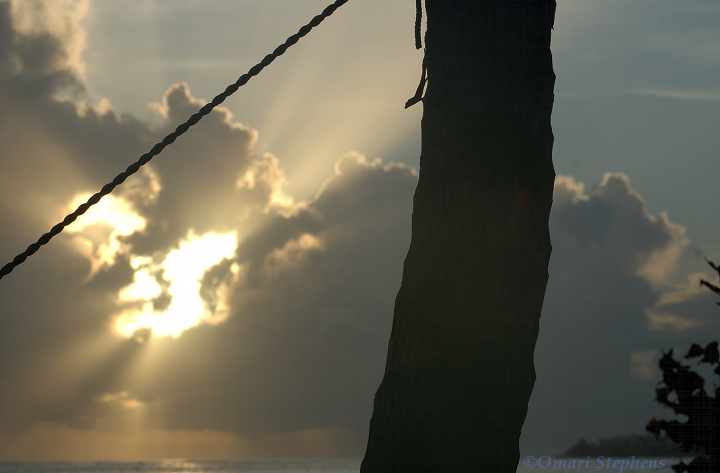 The rope is from a hammock hanging between this and another tree. Back to MIT. In the few years that passed before I shot this in late March of 2008, I had learned the value of patience time and time again. Sometimes, that shot you were hoping for happens after the curtains close and everyone else takes off. In this case, I noticed the road work as I was riding down Mass Ave. I stopped, pulled out my camera, and started shooting. At the time, the saw was sitting next to the light pole, and I got a couple frames of that. I also got a couple nice frames with the saw, police directing traffic, and the Dept. of Roads folks working in the background. At this point, I had all the frames I needed and was considering taking off; but I decided to stick around for a bit longer. It was cold, but it was Boston: it's supposed to be cold. Finally, they walked across the street, replaced the blade on the saw, and fired that sucker up. I asked one of the guys (in blue jeans, mostly obscured here) if I could take photos while they were cutting and he said it was fine; just don't get too close. As I was shooting, he suggested looking down the barrel of the light pole. A couple minutes later, everything finally came together. 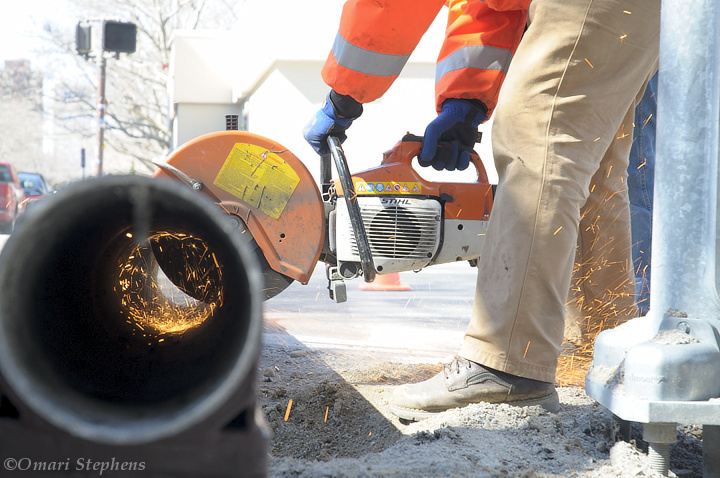 They finished cutting pretty soon thereafter and I packed up and went to go thaw my hands. All in a day's work. 14 months ago, to the day, I took my last cheap flight to MIT before moving across the country to California. During one of my last days up north, I took a day-trip to New York, which led to my "17 Hours of Street Photography" post. 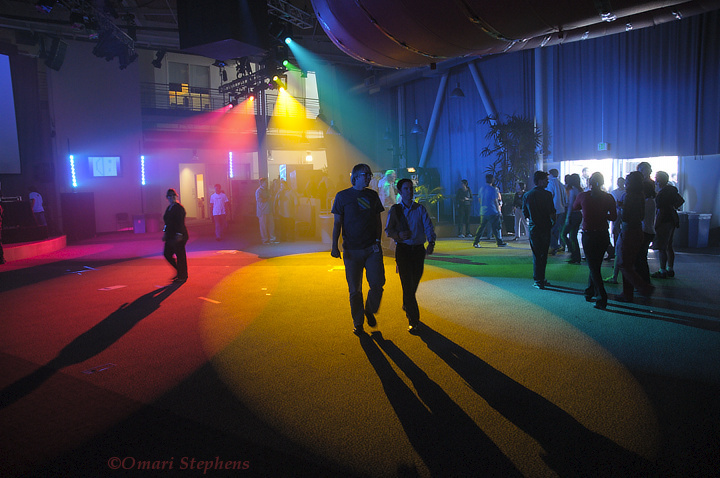 Two days after starting at Google, and a few weeks past my NYC trip, I attended Google Dance. The theme was "Glow in the Dark," and the decorations were spot on. I noticed the cool spotlights when I walked into Charlie's, and after walking around a bit, I stopped and grabbed this frame. The spotlit shadows are awesome. And I didn't notice at the time, but the ROY G. BIV colors were all represented (except that the "indigo" looks more like cyan). A few months after moving out here, I went to a Dizzy Balloon concert. A friend from school is the bassist for the Oakland-based band, and I was curious what they sounded like. Before they came on, though, Picture Atlantic and The Frail both played sets. Pictured is the bassist for The Frail, an electronic band. It was fun watching the bassist strum and hearing what came booming out of the speakers. At one point in the set, The Frail's lead vocalist asked the A/V folks to turn off the lights so he could see the audience. The lights dropped, except for the blacklights and periodic strobes. It was fun, if challenging, light to shoot in. 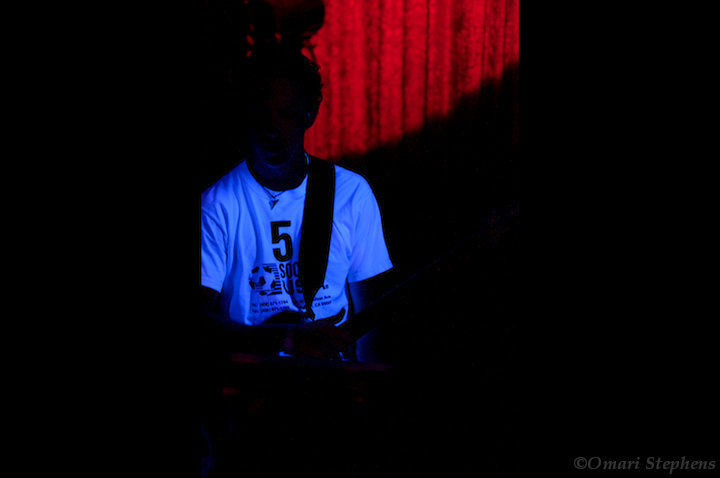 I especially liked the glow of the bassist's shirt, and managed to get a frame with one of the background strobes lit. After The Frail finished, Dizzy Balloon came onstage, and man did they pull out the stops. For details, check out "Dizzy Balloon Rocks", but suffice it to say that they had all sorts of tricks, including a PowerPoint presentation (with sing-along song lyrics) that someone manually drove at multiple frames per second. During the moments before they finally started playing, they cranked up the smoke machine, and then started the laser light show. At first, the laser simply traced out a straight line, which looked pretty cool despite its simplicity. From there, it progressed to a heart pattern and then a smilie face. This is one of the only two good shots I got of the heart shape. 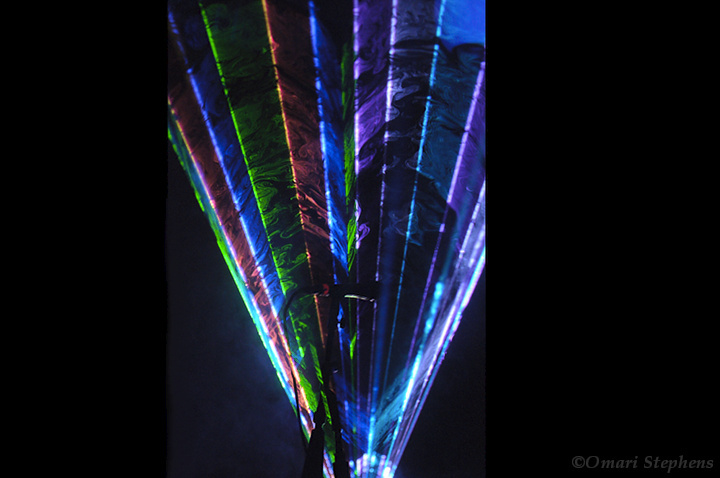 I really like how the laser lets you see the texture (aka non-homogeneity) of the smoke. And the swirls have an uncanny resemblance to the appearance of the end of a piece of mechanical pencil lead through a scanning electron microscope. This is another image that I really, really like, which originally appeared in the post I like it in the city when…. 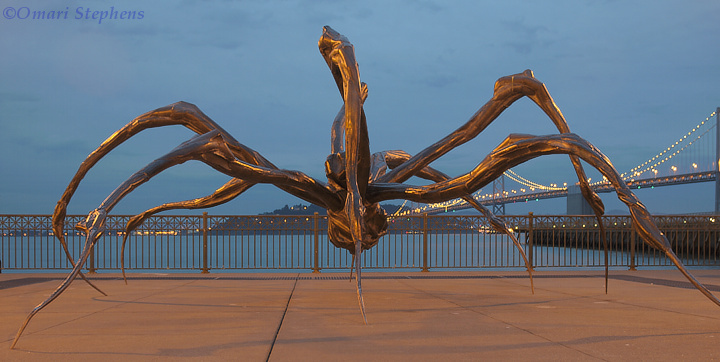 For a couple months this sculpture, "Crouching Spider", settled in front of San Francisco's Pier 14. I happened past one evening while I was killing time, and stopped to shoot some pictures. This is a more recent photo, which I shot a month ago and discussed in We are all of us in the gutter…. 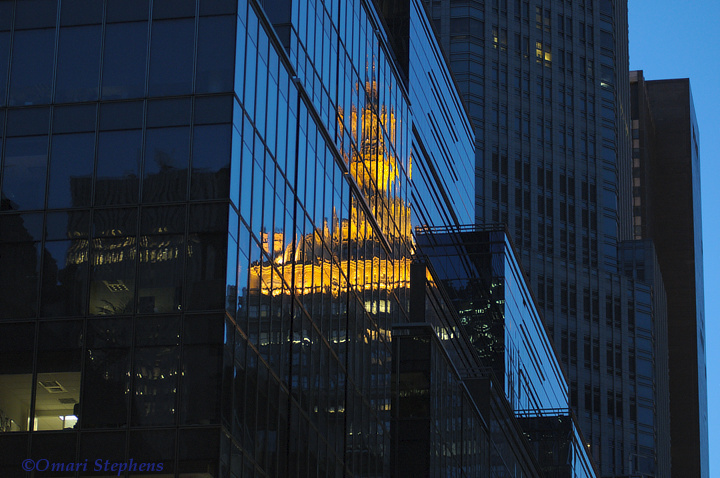 I had noticed this bell on my evening commute at least a few months prior, and had been watching and waiting for an opportunity to get a nice shot of it. On the way home on the evening of Sept. 2nd, I noticed the moon, high in the sky, and figured I'd make a go of it. 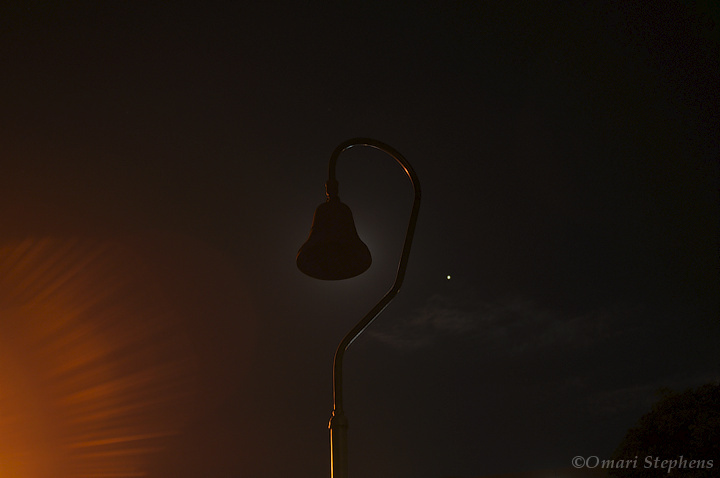 This wasn't the sort of composition I had originally envisioned, but after taking a couple shots, I noticed that there was sufficient cloud cover to diffuse the moonlight in a way that sort of outlined the right edge of the bell. I also accidentally stumbled upon this nice ghosting effect from a streetlamp and ran with it. All in all, I think the interplay of colors and textures works really well. I had been meaning to take some photos of this statue for a few months, now, and when I read the prompt for the contest, this was the first thing that sprung to mind. A version of this was the first image I shot specifically for this contest, about two weeks ago. I took another interim attempt, and finally got this during my third attempt, a week ago. 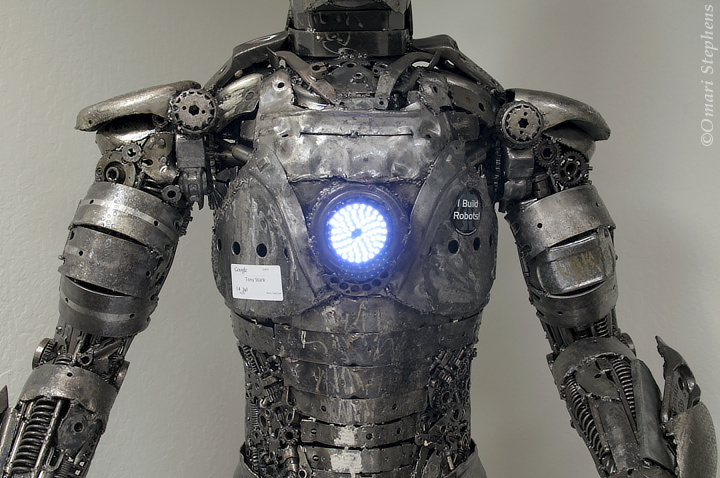 I really like the intensity of the blue LEDs, and the intricate work that went into crafting the body. Furthermore, most if not all of the pieces are recycled automobile and/or tractor parts. Neat. And the robotic aspect is why I used this photo for "I, For One, Welcome Our New Robotic Overlords." This was a long night. I like the first version of this, as seen in "Trying to see the light", but the moon wasn't up. I went out again last Saturday and got some nice shots with the moon. They were pretty good, but it still seemed like something was missing. The night before the contest deadline, I went out again. The moon still wasn't quite where I'd hoped it would be, but I tried to make the most of what was there. 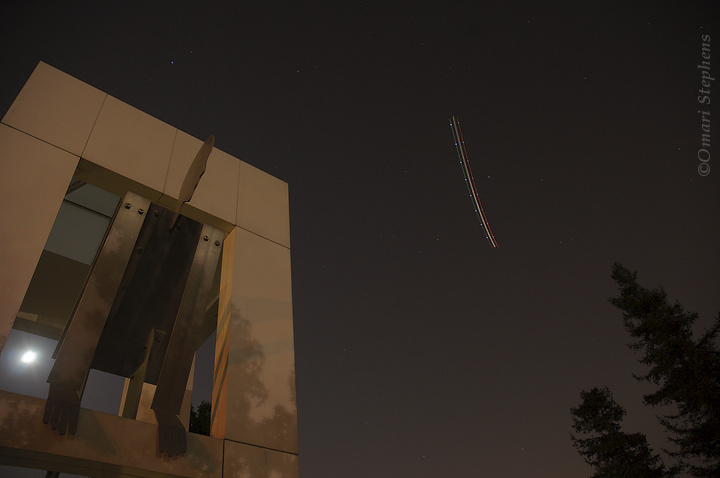 This third time, I was shooting considerably earlier than the first two attempts, so there was a lot more air traffic. I got two frames of this large, slow plane swinging around for an SFO approach before it disappeared over the bay, behind me. I really think the juxtapositions of straight and curved lines, and of spots of light with the shadows and silhouettes are what make this image. Again, it looks best seen large.